When we moved into our house, it had single glazed windows, no attic insulation, and a host of leaks. The wind basically blew straight through it, and it took the heat with it. After installing attic insulation, and adding new rubber seals around the windows and some doors, we decided one of the next moves we would undertake was to install double/triple glazed windows. I’ve been approaching these energy improvements formulaically since the start: How much does it cost to implement? How much will it save each year? How long will it take to pay for itself, and is there any other thing I could do before it with a better payback period? This one however, I think, may be a special case. When I do the maths around Double Glazed Windows, the payback is actually a lot longer than you might expect given it tends to be the Go-To energy saving measure that most people think of when they think about upgrading the energy performance of their house. We are looking at savings of €303 in gas costs per year (I can’t get that exact figure because I’ve installed a wood burning stove with a back boiler, which is also eating into the gas costs). At €7,000 for the installation of the windows, that means a payback period of €7000 / €303.21 = 23.09 year payback. Yikes! Switching to LED lights paid for itself in 9 months, and switching to the Electric Car pays for itself in 5.4 years. 23 years seems like a very long time indeed. So why am I considering it? Well – I think it’s because all energy is not perceived equally. There’s a quality of life issue here as well. Loosing 10kWh per day on an inefficient dishwasher is a terrible waste, but it doesn’t make you cold when you’re eating your dinner. Poorly performing windows do. They also add to the security of the house (our previous windows would have taken approximately one point two seconds to break into), the reduced noise from the road and reduced maintenance on the new, higher quality handles and openings. These are not directly quantifiable into kWh (and hence cost and emissions) savings – but they heavily influenced our decision to proceed with the windows ahead of say, installing Solar PV panels, which would pay for themselves in about 11 years. Before the windows were installed, for the first five months of 2015, we used 7,896kWh of gas (in that same period, we used 15,792kWh of wood). I’m going to estimate a 20% saving in heat required by the house – we have some large bodies of glass, particularly in the living areas, and this seems to be the average quoted online. 7,896kWh for 5 months translated to 18,950.4 kWh of gas used per year before the double glazed windows are installed. If the windows save 20% of this, that means they save 3,790.08 kWh (18,950.4kWh * .2 = 3,790.08 kWh ). Gas costs €0.08 per kWh, which means 3,790.08kWh * .08 = €303.21 saved. €7000 / €303.21 = 23.09 year payback. In terms of emissions savings, 3,790.08 kWh / 11.4772 kWh per M^3 = 330.2269 M^3 per year, and gas emits 2.13793103448275 kg of CO2 per M^3, so the emissions savings are 330.2 * 2.14 = 706 kg CO2 per year. That will amount to 21,180 kgCO2 over the 30 year lifetime of the windows. Twenty one thousand kg of CO2 prevented with one measure is a pretty good haul. 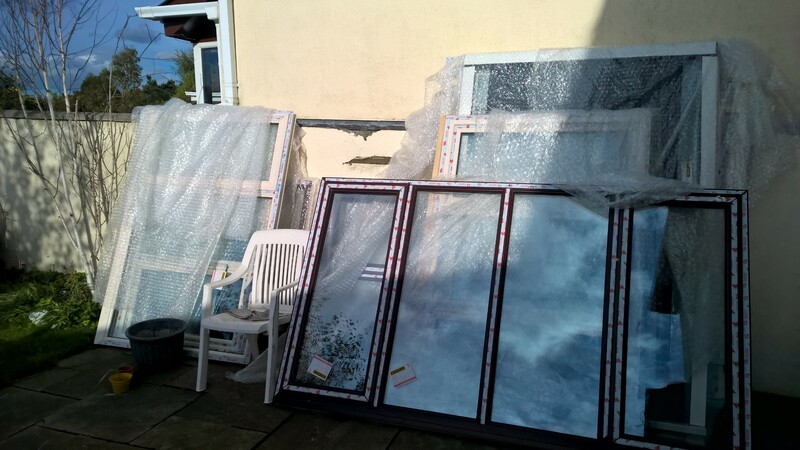 The installation of double/triple glazed windows is not overly long or difficult. It took three days in our house. The windows are measured in advance and manufactured to fit the exact measurements so when the windows arrive, the process is as such: (1) remove the old windows and frames, (2) slide in the new window frames (3) spray expanding insulating foam around the frames so they are fully sealed (4) re-finish any areas on the window boards or walls around the windows which were damaged so everything looks as good as new. It took three days for this process in our house, and have been fully fit into the house for eight months. 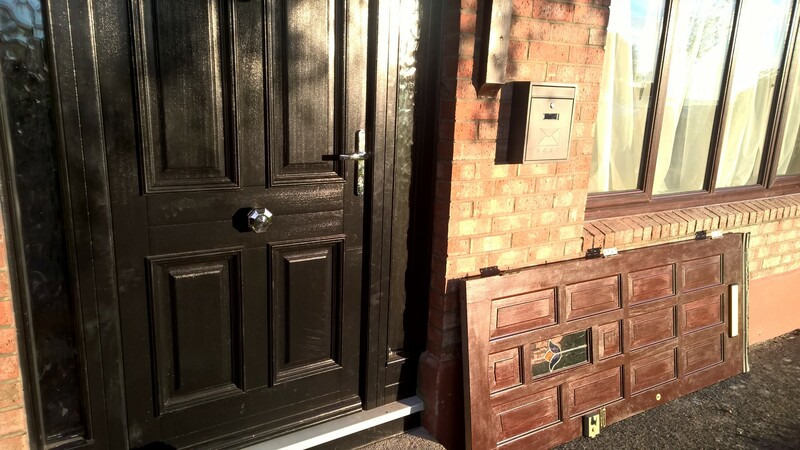 The new (Black) and old (brown) front door. The difference in terms of weatherproofing is phenomenal. The wind used to literally blow through the old front door. The new one is fully sealed, both to the cold, and to noise from the outside. Also, it looks much better. I wanted to experience a winter with the new windows before writing this post, so I could fully understand the difference they make in cold temperatures. The difference has been huge – like the wood burning stove, they have contributed hugely to the feeling of cosiness in the house. The hall is no longer a place you have to run through on cold evenings – the new front door is fully sealed against the searing South Westerly winds hammering against it during the yearly winter storms. The downstairs rooms are also noticeably warmer. Finally, because heat lasts longer in the house, they have increased our ability to heat the house solely with wood. Once it’s above about 4C outside overnight, we can light the fire in the wood burning stove in the evening, and that will contribute enough heat to keep the house warm overnight without the need to add additional heating with the gas boiler. Previously, we needed to turn on the gas late at night every night in Autumn and Spring. That gets us a lot further along the route to energy independence, and saves us a decent bit of money. The verdict: The financial payback is quite long, but the intangibles (comfort, security, noise reduction) are very valuable. If you currently have singled glazed windows, installing double or triple glazed windows is definitely worth doing.